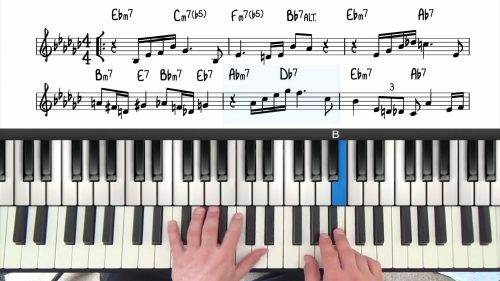 In this lesson we are going to look at some 2 handed minor 251 variations. In the previous lesson on the minor 251 progression, we covered the basic theory and learnt how to voice the chords in our left hand. We know that in a minor 251 progression, the V7 chord is usually an altered dominant chord. Adding alterations is done by either raising or flattening the upper extensions of the chord. The upper extension are the tones 9, 11 and 13. When we add alterations to the V7 chord it creates extra tension and dissonance and this strengthens the sense of resolution into the I chord. In the introduction lesson on the minor 251, we explored the progression with left hand voicings. In this lesson we will spread the notes out over two hands to create bigger and fuller sounding voicings. We start by exploring a new way that we can voice -7b5 chords. The voicing is constructed by playing the root and b5 in the left hand, and a major triad a whole step below the root in the right hand. This gives you the chord tones b7, 9, and 11 in the right hand so technically this is a -11b5 voicing. 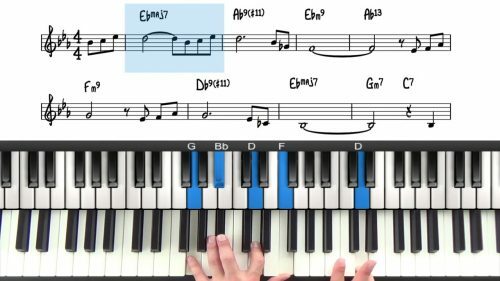 We start off by constructing these voicings in a few different keys and then apply the progressions to 3 well-known jazz standards: Tenderly, Round Midnight and In a Sentimental Mood. My Romance follows a 32 measure A-B-A-C form and the tonality is primarily major. The tune is played as a ballad or medium swing feel. 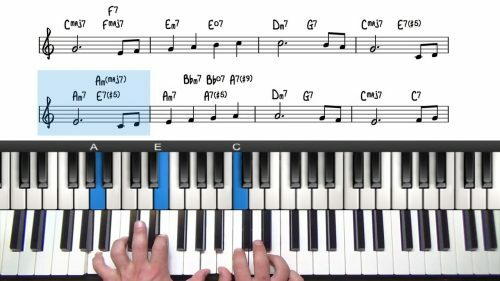 This lesson applies upper structure triads to the tune Tenderly and also discuss ways to add fills and runs in between the chords of this great tune. Thelonious Monk’s Round Midnight contains lots of interesting chord changes. Written in the key of Eb Minor, there are 6 flats to watch out for! As an exercise, take these voicings around al 12 keys. 3 keys were covered in the lesson which is 1/4 of the work done! The key is to remember the formulas in terms of scale degrees - that is the blueprint to apply to any key. Study the accompanying lesson for applying these voicings in context of jazz standards. Always analyse the melody note over -7b5 chords, if the 11th is in the melody, then the -11b5 voicing will be an excellent choice. If the 11th is not in the melody, you can always tweak the melody, or reharmonise the chord changes.